1. More trouble at Tesla: The Securities and Exchange Commission filed a lawsuit against Tesla CEO Elon Musk on Thursday accusing him of making "false and misleading" statements to investors. The commission is asking a federal judge to prevent Musk from serving as an officer or a director of a public company, among other penalties. The complaint hinges on a tweet Musk sent on August 7 about taking Tesla private. "Am considering taking Tesla private at $420," Musk wrote. "Funding secured." The SEC said he had not actually secured the funding. The lawsuit could prove costly for Tesla (TSLA). Shares in the company dropped 11% in premarket trading. 2. Ryanair strikes: Shares in Ryanair (RYAAY) swung between losses and gains after the budget airline canceled 250 flights across Europe because of strikes. The carrier already suffered this summer from a sharp rise in fuel costs and strikes by air traffic controllers and pilots. Its shares are down around 12% since the start of the year. Rival low-cost airline EasyJet (ESYJY) said Friday that it expects profits to rise this year, noting that it has "benefited from Ryanair cancellations." 3. Shaky Italy: Italian bond yields jumped Friday, suggesting investors are starting to worry more about the country's ability to pay its debts. Italy's populist government agreed Thursday to put forward a budget proposal that would result in a much higher deficit than last year's, putting it on course for a clash with the European Commission. "Italy is bringing itself into a precarious position," said Holger Schmieding, chief economist at Berenberg. "Because Italy's underlying fundamentals are shaky, it may not take much to trigger a major sell-off in Italian bond markets that would weaken banks, tighten financing conditions and dampen economic growth further," he added. The main stock index in Milan dropped more than 2% on Friday morning, significantly more than other major European markets. 4. 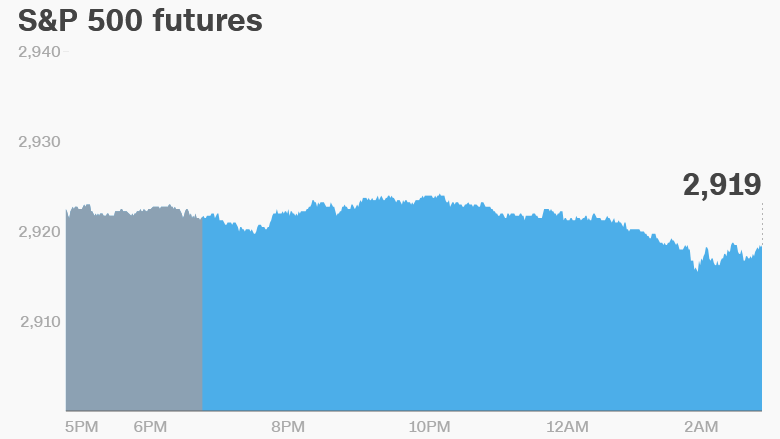 Global market overview: US stock futures were flat early on Friday. The Dow Jones Industrial Average closed 0.2% higher on Thursday, while the S&P 500 was up 0.3% and the Nasdaq gained 0.7%. 5. Earnings and economics: BlackBerry (BB) plans to release earnings before the open Friday. The Bureau of Economic Analysis will publish its August PCE prices at 8:30 a.m. ET. Bed Bath & Beyond (BBBY) plunged 21% on Thursday after reporting poor same store sales. At one point the shares were down as much as 25%, hitting an 18-year low.